Since 2009, a colorful display of adorable oversized Servbot replicas greeted visitors to Capcom's Tokyo headquarters. Sometimes, they even pose with celebrities. However, those days have come to an end. The bots have been seemingly replaced by equally adorable, oversized Monster Hunter Felynes. Now, now... I wouldn't look at this as some sort of conspiracy against Rockman DASH (because that's just ridiculous). People generally like to rearrange things from time to time, you know? Helps living spaces stay fresh and lively! Fortunately, Rockman himself remains diligently in position. That statue (only two in existence) has been a prominent display at Capcom Japan HQ for well over a decade. It's become something of a corporate symbol. Perhaps there is no contest in declaring that the Felynes are Capcom's most popular characters in recent years, what with their marketability spurning countless toys, merchandise, and even video games. The Servbots found themselves in a similar position in the late 90's/early 2000's -- often appearing on everything from PUDDING to Band-Aids. But those days are behind us. Their marketability has diminished within the last few years, sad to say. Fortunately, Servbots continue to cameo in numerous Capcom games, keeping them in the limelight. But I digress. The Servbots have likely relocated somewhere else within HQ. 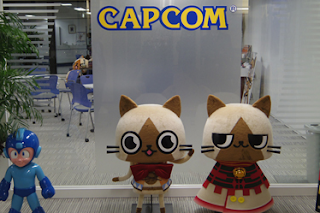 Before '09, they frequently popped up at Capcom's Osaka offices and even Plaza Capcom as decorations. And before that? Tokyo Game Shows, promotional photo ops and Rockman's 20th b-day bash. These displays have a legacy; very little doubt in my mind Capcom would simply throw them away. And once again, the fandom overreacts to this. Capcom took them to the back of the building and put them down... just like they did to Megaman Volnutt. Well I guess the Felyne is the new 'mascot' which is alright with me. Whatever makes the company money is a good thing. Could have made both of them a bit taller though. Anyways, at least I know a Servbot won't toss a bomb at me and ruin my chances of killing a monster, unlike someone else I know. Probably why the one on the right looks so smug. Gotta wonder who will replace them as the next 'mascot'. Man. :( I hope the Servbots just got moved to another section of the building or something. "very little doubt in my mind Capcom would simply throw them away." Again, the fandom's rage continues. But hey, at least there's Kingdom Hearts 3D for the 3DS to look forward to and unlike Crapcom, that game has no way in hell of being cancelled. Keep up the good work, Square-Enix. Sorry, but I'm a huge fan of that gaming company. I lost all respect for Crapcom with the way they're treating MegaMan and his fanbase,They, Nintendo, Namco and other famous gaming companies are waaay better than Crapcom now. The Servbots would have had a similar position in 2011 as their position in 1999, 2001, IF ONLY PROTOTYPE WAS RELEASED. By the only account of its playability, the game kicked-arse and had enough content to justify 2 dollars. So yeah, I see this as conspiracy, lost opportunity, and a sign. I really wish I didn't though, but with Capcom.... Nothing's ever certain anymore. Also, doesn't anyone notices there is A FREAKING ROCKMAN FIGURE right besides the felynes? Although then again, the article IS actually about the giant Servbots being retired from their greeting job. But then again, it can be misinterpreted as "Capcom is slowly phasing Rockman out". Are you even surprised by this point? Keep an eye on that dumpster, when the MegaMan statue gets replaced with Ryu, you're gonna wanna act fast to get it. Probably a conspiracy, those statues have gone the same way as the companion cube. It's kinda sad for fans considering recent events, but decorations change as time passes. Before the Felynes and Servbots, which characters were on display alongside Mega Man? Well the Megaman doll is still there. Don't really see why any fans would be piss off at this. Now if they ended up placing Megaman Items all around the office and take pictures of it with the words "We still care" underneath it then that something else. "Now, now... I wouldn't look at this as some sort of conspiracy against Rockman DASH." For fucks sake guys: It's a /statue/. Are you really going to overreact over this? Sure, The servbots would have been popular if the prototype came out, but it didnt, and as such they're going to get moved. It's not about the conspiracy mess, it just seems like an inopportune time to get rid of Servbots from the, you know, forsaken Legends Series. It just looks bad. What are Felynes? This is the first I've seen or heard of them. Felyne's are (Wouldn't be surprised) the mascots from the Monster Hunter series. On topic: Yeah. It's disappointing that the Servbot's had to go. But in the long run; They had been there for quite a while as mentioned. Maybe the workers were getting bored and wanted something new? Or maybe they think it looks a bit awkward having the Servbot's at the entrance, with the cancellation of Legends 3 still tainting the company image to many. To cut a long story short: I bet they had reasons that did not involve the words 'Discreetly','Retiring','Megaman' in the sentence. And if at anything. I kinda think the Felyne's they got are rather adorable. Personally, I have given up hope for MegaMan games with the way Crapcom is now. That MegaMan is still important to Crapcom stuff? Nothing but lies. You don't see the same thing happenning tp Mario, Pokemon, Final Fantasy, Pac Man, Etc. I respect the comapnies who made them, except for Crapcom cause all they're doing is making overated fighting games and I can see why people are boycotting their products. But the point is, GET OVER IT. You're acting like babies. Rock on forever!!! Thanks for the pics and websites!! I mean, first of all, MH is a top-selling franchise. Second of all, MM Classic is still there. Last and not least, any reminder of Legends is a demotivator and controversial piece for the Capcom workplace. Building that is hard enough; anything that could destroy that (on top of the already daily jabber) should really be removed, just as a professional measure.